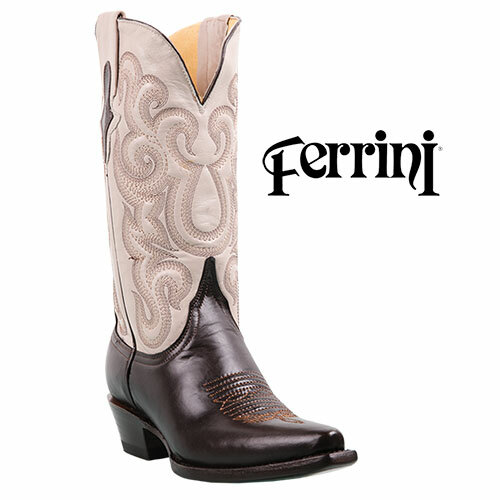 These Ferinni women's boots are worth every penny of their retail price. Act today and get them for one low price! Whether you're an urban cowgirl from Manhattan or the real deal from Montana, you'll love the look and comfort of these genuine Ferrini boots. All hand-crafted, these sharp looking fashion toe boots are crafted from chocolate colored genuine French calf leather on the upper with a beautifully feminine embroidered 12" pearl leather shaft for a look that will turn heads wherever you go. Also features leather linings, leather outsole, single welt construction, 1.5" heel, pull-on loops and v-shape shaft for greater movement. Color: Chocolate. Womens size 8.